Featured on the Travel Channel and just a short stroll from “On the Coast of Somewhere Beautiful” at Summerspell – Pompano Joe’s is a Destin/Miramar Beach favorite. Caribbean flavor of the islands with local seafood makes every bite delish! Caribbean flavored drinks are a must at Pompano Joes. My favorite is the Caribbean Cooler – served in a souvenir glass for you to take home. Located directly on Miramar Beach, the view from the restaurant is one of a kind! Watch dolphins play and waves roll in while you dine. You can even stroll over for a quick beverage or snack at the downstairs bar while you are enjoying your beach day. If it lives in the ocean it is probably on the menu. Pompano Joe’s menu is full of local seafood at affordable prices. Don’t forgot to try the award winning gumbo. Pompano Joe’s gumbo is a 3-time winner of the Sandestin Gumbo Festival! Pompano Joe’s t-shirts make a great souvenir. 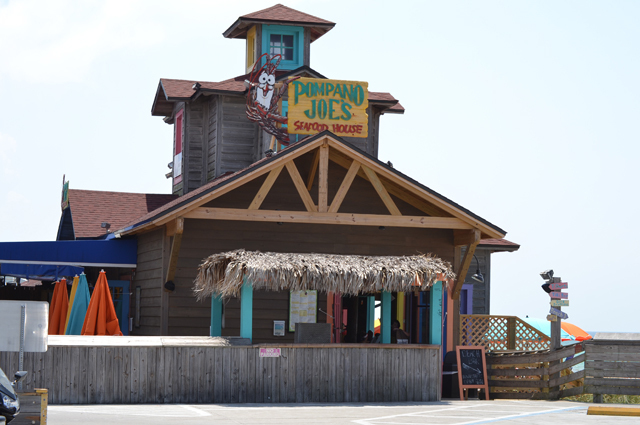 Don’t forget the photo op with Pompano Joe’s sign with the Gulf as a backdrop for your special memory of your vacation. Of course, Pompano Joe’s is family friendly and dress is casual.